I rolled over in bed and quickly realized that was a huge mistake. The whole side of my body morphed into fine goosebumps and I was awoken to the crisp Chicago night and freshly pressed bed sheets. Streaks of moonlight creeped through my blinds and splashed parts of my bed. It was eerie but serene at the same time. I pulled the covers closer to my body and gazed out the window. The warmth was rushing back towards my body as I bent my legs towards my chest to trap it in. I saw a silhouette of the tree standing in the front yard. During the day it stood in solitude and most of the time barely noticeable but tonight it looked intimidating, fearless and beautiful. The daytime suffocated her true self. She needed to release. The tree was simply stealing the night in order to display her true brilliance. We all steal in one way or another. I thought to myself. I took in a deep breath of the chilled night air and reflected on the desires of the human spirit. My chest rose as thoughts stirred in my mind. I needed the tree to share the night with me. So I stole a bit of it for myself. I did so unapologetically and without shame. Life feels full, but nonetheless very enjoyable. At 28, I feel like I am reaching a point of self-realization. I am growing into myself and feel more confident with the woman I am becoming. I have had opportunities to be independent, extensively travel and pretty much “do me”. It always amazes me the turns that your life can take. I always tend to think that I control the major and minor occurrences in my life. Now, don’t get a sista wrong… I firmly believe that Allah has ultimate control but I think we play a huge part in how our lives turn out as well. In my early 20’s I would have never thought that I’d be unmarried and globe trotting. We all walk different paths that may converge with that of our family and friends and sometimes they never converge at all. People get married in clusters then they start getting pregnant in clusters too. Think of it like this, in every group of friends there is that one person who kinda does their own thing. The one who is going against the grain of expectation and normativity. Society dictates what you’re supposed to have, when you’re supposed to have it and how you’re supposed to get it. Are people just cookie cutters of one another? Should people be labeled or pointed out when they don’t fit into what society expects of them? As women we get stuck with this big time. Once you reach a certain age (normally after 30) certain “things” are expected of you. It’s almost as though many of us have an expiration date that is shadowed in the fear of not fulfilling those societal demands. Once we get into our late 20’s we’re in a rush to get our lives “together”. Life is not set up like that. There is no “set” age or time to get married, have children or even to be settled in a career. I’m sure those things work as motivators for many people but I refuse to live my life in the cloud of societal demands. I think about my life and where I see myself in the future inshAllah. I certainly want to get married and have a family, but quite frankly I am enjoying my life. I’m living in the now and attempt every day to be conscious of the present. The past is long gone and the future awaits me, God willing. Right now is what counts and it is the only thing I can control at this given point in time. There is a time for everything in your life. I recognize the chances of me finding someone as mobile as myself is pretty rare. I will have to adapt certain aspects of my life and the older I get I understand that people become less flexible. So don’t misunderstand a sista because I know that time is precious and it must not be wasted. One must strike a balance of living for oneself as well as understanding the realities of life. This balance can be hard to achieve and it is something I work on quite often. Right before bed and in the early hours of the morning have always been a time of reflection and thought. Many researchers have said that trees are some of the few plants that can show physical manifestations to outside stressors. Air quality, soil conditions and limited space can inhibit their growth. Just like the human spirit trees need space to fully flourish and reach their highest potential. If not they remain stagnant and eventually die. One must be rooted in the knowledge of self in order to grow. Remember, there is no growth without firm and planted roots. I take my time to grow and breath so that when love comes my way I am ready for it to plant itself deeply within my heart. Until then, I steal pieces of the night and patiently wait for the daylight to bring its lessons on life. Another year of love, sacrifice and the mushy gushies has sneaked upon us. Love is in the air and I am such a softee during this time of the year. I suppose I am a hopeless romantic at times. Muslims love to be the first to vocalize their disdain for non-Muslim “American” holidays. We see it all over Facebook and Twitter. Personally, I think it goes slightly overboard. I would be very offended if non-Muslims had the same attitude towards Ramadan or Eid. Regardless the meme wars have begun! Now, I can understand the religious standpoint as to not wanting to celebrate certain holidays. All the power to you. A sista gets it, you are trying your best to remain steadfast on the Quran and Sunnah. May Allah make you successful. With that being said many Muslim men are really lacking in the romance department. The art of wooing a woman has been lost. Is it not the sunnah to be romantic and treat your wife in a loving manner even after you are married? Romance is a lost sunnah and for some V-day assists in rekindling it. One thing I realized is that Muslim men love to religiously legitimize not celebrating certain holidays. 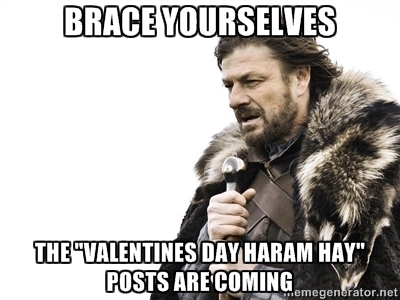 Most of the anti-vday propaganda is initiated by them. Brothas, now if y’all were smart you would take advantage of this day (or any other day of your choosing). It really does not require a lot of planning. Every store, boutique and flower shop caters to the “man” customer during this time of the year. They understand you get easily overwhelmed and hate to shop so as a result everything is laid out for your shopping convienence. Allah says your spouse should be appreciated every day. I celebrate Valentines day all the time! Muslims don’t celebrate a holiday rooted in pagan theology. Sister, you get no flowers! As a Muslim woman what does is mean to be truly “appreciated”? Does buying me a bouquet of roses or box of chocolates cut it? Of course, I don’t view V-day as being the ultimate display of whether or not a man truly loves me. With that being said, truth of the matter is that everyday you don’t get taken out to a special restaurant nor do you get flowers. What’s so wrong with having one day dedicated to being treated like the sistaqueen you are? When we live in a culture where folks are caught up with work, school and family its nice to have a day solely dedicated to celebrating your love. Everyday throughout the year you are hustling at work or in school. These are the physical labors of your love in a relationship. Whether or not you celebrate V-day take one day aside to just unwind and let your partner know how much you appreciate them. Anyways, who doesn’t have the time to celebrate another capitalistic holiday?